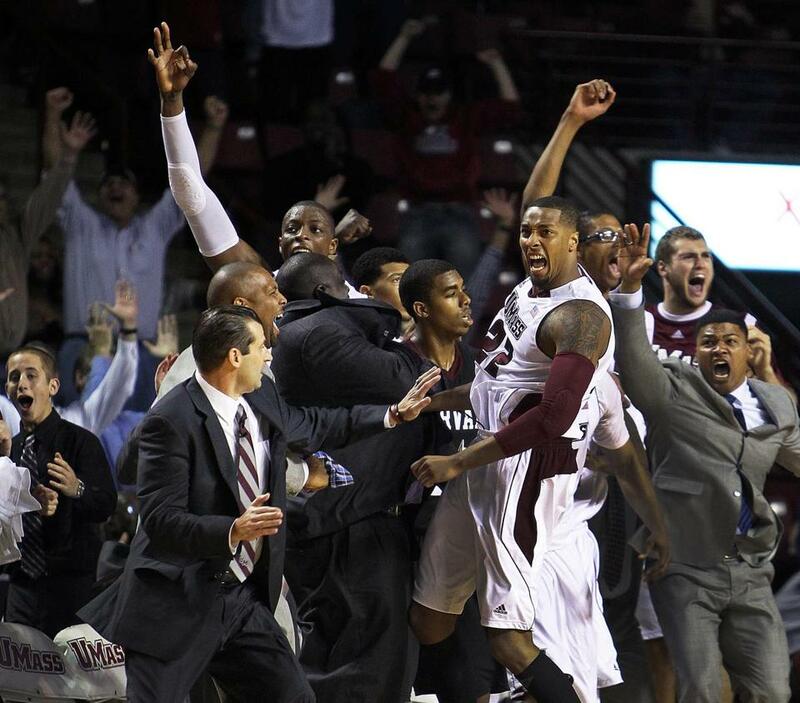 University of Massachusetts forward Sampson Carter (22) sent fans into a frenzy after he hit a three pointer from the corner in front of his team&apos;s bench at the buzzer that broke a tie to give the Minutemen the victory against Harvard. AMHERST — In most years, the University of Massachusetts men’s basketball season opener against Harvard might have been viewed as an appetizer, a way to ease into the grind of the season against an opponent from the Ivy League. The Crimson, who entered the game missing their two best players from last year’s Ivy League championship squad that earned an NCAA berth, gave UMass all it could handle before the Minutemen pulled out a 67-64 victory at the Mullins Center Tuesday. Sampson Carter, who missed his first two field goal attempts of the game, was alone in the corner in front of the UMass bench when junior guard Chaz Williams found him with a kickout pass that Carter converted into a winning 3-pointer. Jesse Morgan led the Minutemen with 19 points while Raphiael Putney had 13 and Williams 12. After a stellar performance in 2011-12, Williams is revved up about steering the Minutemen toward the next level — an NCAA Tournament berth. Harvard was led by Wesley Saunders, who had 18 points, while freshman guard Siyani Chambers added 14 points. With Kyle Casey and Brandyn Curry withdrawing from school amid allegations of being involved in an academic cheating scandal, Harvard is attempting to repeat as Ivy League champion, and it was taking on a UMass team that returned four starters from a 25-12 squad that advanced to the semifinals of the National Invitation Tournament. After trailing by 10 points three times in the first half, the Crimson mounted a 15-4 run in the final 3½ minutes to pull within 38-37 at halftime on Christian Webster’s knockdown 3-pointer at the buzzer. Kenyatta Smith, a 6-foot-8-inch sophomore center, gave Harvard its first lead, 39-38, with 19:19 remaining on a strong up-and-under move beneath the basket. Putney, however, quickly wrested it away when he converted a backcourt steal into a breezy breakaway basket to make it 40-39. After Maxie Esho blocked Chambers on a run-out attempt, Steve Moundo-Missi kept the ball alive and put it back for a layup that gave Harvard a 41-40 lead. A key-top 3-pointer by Esho enabled the Minutemen to regain a 43-41 lead, but the Crimson fought back and tied it thrice (at 44, 46, and 54). Saunders broke the stalemate with a strong layup to give Harvard a 56-54 lead with 6:37 to go. Morgan converted a backcourt steal into an easy transition scoop to tie it, 56-56. Saunders went to the line after being fouled on a drive to the basket with 5:20 to go, but converted only the first of two attempts to put Harvard up, 57-56. Putney and Webster traded 3-pointers, and the Crimson led, 60-59, with 3:32 to go. Moundo-Missi extended the lead to 3, 62-59, with 3:06 to go when he induced Terrell Vinson (8 points, 4 rebounds, 4 blocked shots) to commit his fifth personal and made both ends of the one-and-one. Saunders gave Harvard its biggest lead, 64-59, when he hit a pair of foul shots with 1:21 to go. But Morgan converted a lane leaner with 1:12 left to pull UMass within 3, 64-61, then tied the score with 37.6 seconds left when he splashed a huge 3-pointer. Carter, though, provided the heroics for the Minutemen when he converted his wide-open trey is the final seconds.